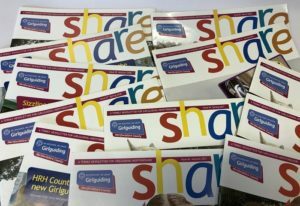 SHARE is our termly magazine posted to all adult members of Girlguiding Hertfordshire. It is packed with stories and photos of what everyone has been doing, from cake sales to camping, crafts and adventures, and from Rainbows to the Trefoil Guild. To submit your story send us an email here together with a completed and signed photo consent form for all those featured in photographs. Please attach the original photos (with picture sizes of 1MB-3MB if possible). Please note photos submitted may be used for Girlguiding Hertfordshire publicity. The deadline for submission of articles for SHARE 41 is 17th May 2019.